Last year, Neil Young made a surprise guest appearance at Pearl Jam's concert at Toronto's Air Canada Centre. 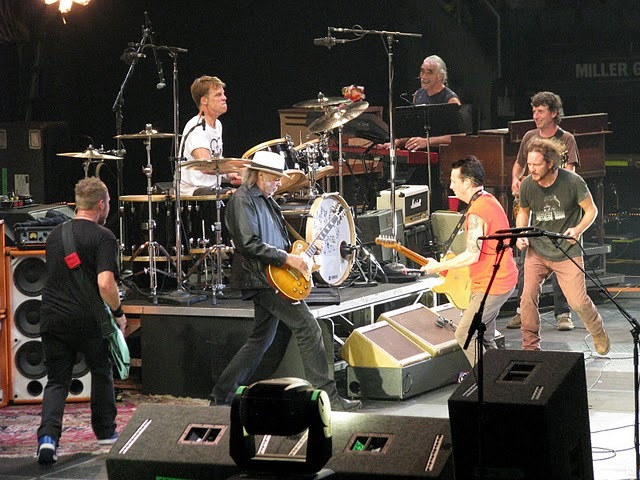 Young and Pearl Jam played together for 'Rockin' in the Free World" as the final encore. 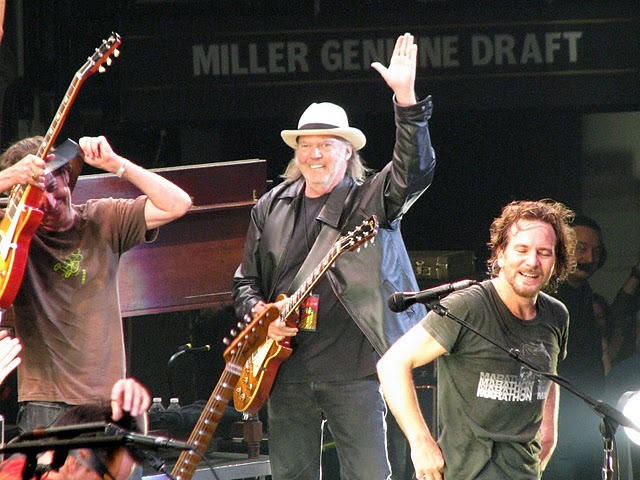 The above clip captures much of the excitement of the moment and has a number of fascinating glimpses of the band's camaraderie with Neil. Note this is only the last few minutes of a 15-minute "Rockin' In The Free World" which ensued. When Young walked onto the stage, it was as if the ACC roof was going to give way, with the crowd bursting into thunderous ovation. Mike McCready ran side stage and handed his guitar to Neil, who came out during the extended solo section, and Neil joined the guys by bouncing around and throwing lead licks off every corner of the building. McCready ran and snagged another guitar so he could re-join the fun, and fun it was – ear-to-ear smiles from everyone in the room, including all PJ members. 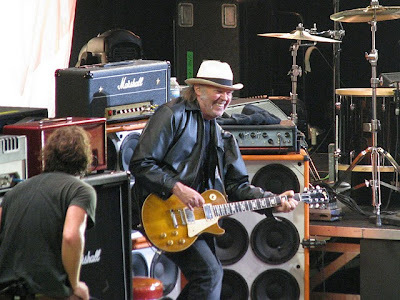 Eddie Vedder said: "If Pearl Jam are being called PJ20 this year then Uncle Neil would have to be dubbed NY51". Neil was in town for the premiere of new Jonathan Demme film Neil Young Journeys at the Toronto Film Festival. UPDATE: Another angle with Neil joining @ ~3:00 Pearl Jam w/ Neil Young - Rockin' in the Free World - YouTube. Neil seems to have so much fun whenever he jams with these guy's. It just go's to show that no matter how big and successful these young bands are, there's so much that can be learned from the veteran master.As Doc said, there's a huge amount of respect towards Neil from P.J. and other bands from that 'grunge era'.It seems as R.I.T.F.W. is the standard when they play together ... I would love to see them do 'I Got S--t"!